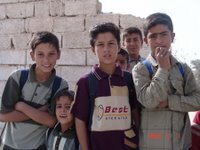 “The ongoing difficulties faced by Fallujans are so great that words fail to properly express it.” Words from a cleric in Fallujah as he tried to explain the litany of ills that continue to afflict his city one year after the U.S.-led assault took place. “All the men in the mosque were from my neighborhood. They were not terrorists.” Words from a young man who said he left a room of men either injured or homeless thirty minutes before the raid on his mosque, the same mosque shown in the now-famous videotape of an American soldier shooting unarmed men lying on the mosque floor. “There haven’t been any funds for home reconstruction available since the change in Iraqi government last January.” The words of a civic leader from Fallujah as he showed CPTers the still-devastated areas of his city. There are no words. A city that has been demonized by Americans and many Iraqis, using the words “the city of terrorists.” A city that its residents call “the city of mosques.” A city that even its residents have to enter at checkpoints, often taking up to an hour to traverse. A city that is being choked to death economically by those same checkpoints. CPTers and a member of the Muslim Peacemaker Teams came to Fallujah to meet with friends and contacts to ask them if the city was planning on doing something in remembrance of the tragic events of last November when U.S. forces attacked their city of 300,000 to root out, by U.S. estimates, 1,500 terrorists. What we heard in response were words of remembrance, resistance and resilience. The cleric said that a number of civic leaders had come to him with a proposal for an action in remembrance of the anniversary. Their proposal was to raise funds to contribute to relief efforts for the victims of the earthquake in Pakistan. He said that a teaching of Islam is to always look to aid others in need before asking for aid yourself. The cleric said that he recently traveled to another Middle Eastern country and during his visit he met with a cleric from Libya. The Libyan cleric said that in his city, and in other places in Libya, parents are naming newborn girls “Fallujah” in honor of the city. The cleric said that more than 800 girls had been named Fallujah in his city alone. Words are inadequate, but words are all we have. Words like “collective punishment” and “ghettoize” come to mind for the current state of life in Fallujah. What words or deeds could undo the massive trauma faced by the people of Fallujah every day? Everywhere we went during the afternoon young boys listened to our words and the words of those with whom we were meeting. I kept wondering what was going on in their minds as they relived the events of a year ago and the ensuing trauma. What effect will these events have on their lives as they grow up? From Oct. 4th until Oct. 17th CPTers accompanied and then stayed with a group of nineteen Palestinians living in Baghdad who decided to try to gain refuge in Syria: refuge from the night raids, arbitrary arrests and torture-induced confessions their community has been subject to by Iraqi security forces for eight months. They are still camped out at the Syrian border awaiting news from the Syrian government as to whether or not they can enter Syria since their status since 1948 as “guests” in Iraq does not allow them to enter neighboring countries. Tuesday, October 4th - It is midday and the temperature in this desert region of eastern Iraq is around one hundred degrees Fahrenheit. Nineteen Palestinians from Iraq, three CPTers, their translator and one member of the Muslim Peacemaker Teams have just spent the night sleeping on the sidewalk at the Al Walid border crossing between Syria and Iraq. People have enough water, but the intense heat is still taking its toll on the men, women and children. There are dozens of tractor-trailers waiting to cross the border. One of the drivers sees the group and pulls his rig close to the sidewalk, creating a protective shadow for shade. Thursday, October 6th - The UN has arranged for the community to have two meals per day at the border-crossing cafeteria. The Syrian cafeteria manager is talking to community members about how things are going. One person mentions that there is very little to do as they await word from the Syrian government regarding their status. Soon afterwards a soccer ball appears and is given to the community. Both children and adults find it a welcome source of recreation. 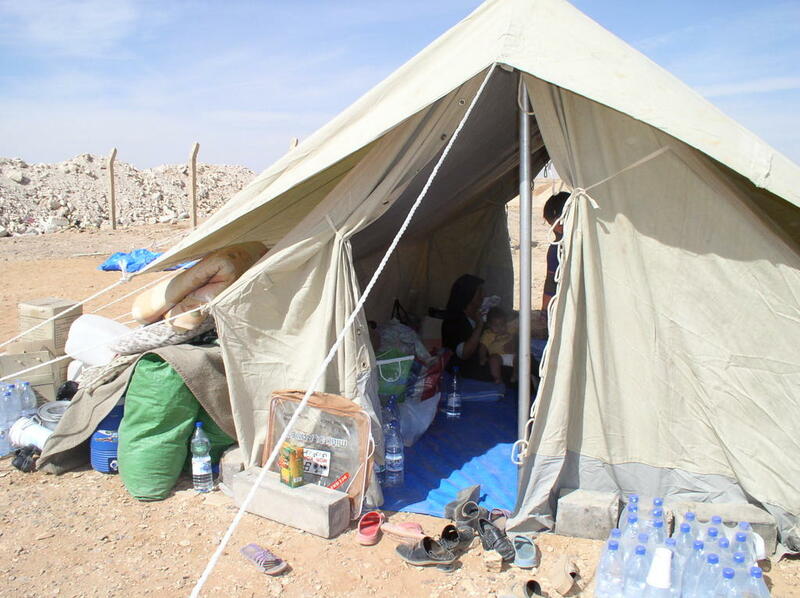 Monday, October 10th - The group has been living in tents provided by the UN for six days. The five children (ages 1 to 13) are getting bored and anxious. CPTer Sheila Provencher and the CPT translator have decided to start a one-hour “school” every morning for the older children. Provencher will teach English and the translator will do art. The first English lesson is teaching words about the weather using the “Itsy, Bitsy Spider” song. Tuesday, October 11th - The Syrian government still refuses to allow any of the Palestinians to enter Syria as refugees. Two members of the community pay a social call to one of the Syrian officials in charge of the border crossing. At the conclusion of their visit they invite the officer to come meet everyone at the camp. He arrives several hours later as members of the community are gathered under the star filled sky next to a roaring campfire. Community members offer him tea and the conversation goes on late into the night. When the CPTers left to return to Baghdad on Oct. 17th everyone gathered to share a final meal together and take many pictures and give many hugs, handshakes and kisses. On the bus ride up from Baghdad the community asked CPT to be a protective nonviolent presence through the Iraqi and U.S. checkpoints. After Ramadi, where the danger is bandits and kidnappers, the community said it would be a protective nonviolent presence for CPT. One of the members of the community said, “We will be responsible for each other.” Distance has separated us but that sense of responsibility to each other remains. We are gathered around a campfire sharing chai (tea) and fellowship. “We” consists of nineteen Palestinian men women and children (ages one to thirteen) who have either been born in or have lived most of their lives in Iraq. “We” also consists of three CPTers, one member of the Muslim Peacemaker Teams and CPT’s translator (who is also Palestinian). We are camped at the Al Walid border crossing between Syria and Iraq and are awaiting news from the Syrian government. News of whether or not the Iraqi Palestinians, who are currently barred from entering Syria, will be granted refugee status by the United Nations, which will be recognized by the Syrian government. But why would these people want to leave Iraq now? Iraq is now on its way to democracy. The tyrannical régime of Saddam Hussein has been gone for two and one half years. The reason is quite simple; the new Iraq government’s security forces have made Iraqi Palestinians primary targets for harassment, arbitrary arrest, torture-induced confessions to crimes they didn’t commit and in some cases death. All in the name of demonstrating how well the government’s campaign of ridding Iraq of foreign terrorists is going. But why the Iraqi Palestinians? First they are easy to find. Most live in two large compounds in Baghdad. Second, they are defenseless. Iraqi Palestinian’s are barred from owing firearms. Third, they have no political clout. They can’t vote, own property or even own a car. Fourth, they are small in numbers. The total population in Iraq is around 23,000. Fifth, Saddam used them to promote his political prestige with Sunni Arabs in the Middle East by giving them subsidized housing, a fact that was resented by many Iraqis. They were forced out of those apartments during the first months of the U.S. led invasion. So here we are gathered around a campfire in the desert. We spent the first night sleeping on the sidewalk at the Syrian side of the border crossing. Trucks roared by all night making sleep almost impossible. Yet several said it was the best nights sleep they had gotten in months. No sirens, no gunfire, no house raids in the middle of the night, no one being hauled away by Iraqi security forces perhaps never to be seen again. Now into our eighth day we are living in tents provided by the UN. We are eating two meals a day in the border-crossing cafeteria thanks to the UN as well. My teammate, Shelia Provencher, and our translator have started a one-hour “school” each day for the children. As I am writing this the men are playing a game of soccer and we wait. Wait to see if the UN and Syria can reach a solution to this humanitarian crisis. The draft constitution for Iraq that has been published in the Western press has been widely reviewed and commented upon by many individuals. There have been ongoing revisions to the constitution. The most recent version was released internally on Sept. 13th. This version has not been disseminated to either Western or Iraqi press or to the Iraqi public. CPT Iraq was sent a copy by a contact in the government. While much of the document is similar and most changes are more in terms of replacing a word or two there are some significant differences. 3. “The National Assembly can, when necessary, and with a majority of two-thirds of its members allow events stated in #1 and #2 to take place.”This provision is completely missing from the current unpublished version. Perhaps a more subtle change is in the “Fundamental Principles” section. In the published draft, Article 2 states: “No law can be passed that contradicts the undisputed rules of Islam.” In the unpublished current version, the article reads, “No law that contradicts the established provisions of Islam may be established.” Now this may be splitting hairs but Iraqis have said that “undisputed” would imply Islamic law that is recognized by both Sunni and Shi’a. The word “established” would imply that law that exists in one branch but not the other would be considered the basis of national law. This could create serious tensions if a Sunni or Shi’a were required to obey a national law that is outside of their particular faith tradition. Financial issues play a major role in the constitution and there is a significant contradiction in two sections of the unpublished current version. In the “Powers of the Regions” the second clause of Article 117 states, “Regions and governorates shall be allocated an equitable share of the national revenues [as a clarification oil revenue is considered national revenue] sufficient to discharge its responsibilities and duties.” But there is an addition to the unpublished current version in reference to oil and gas revenues that states, “A quota shall be defined for a specific time for affected regions that were deprived in an unfair way by the former régime or later on.” In other words the Kurdish region or a new Shi’a region in the south could get the lion’s share of oil revenues for years while the Sunni central region gets but a pittance. This document is not available to the people of Iraq at this time (Sept. 24th) and yet they will be asked to go to the polls and vote on it in 23 days. Is this democracy or yet another chapter in the ongoing saga of sectarian and religious divisiveness in the country? Back in the days of Saddam, religious and ethnic persecution was commonplace. Shi’as were subjected to detention and harassment by Sunni led police and military and in some cases injured or killed simply because of their religious tradition. Back to the future of Iraq in Sept. 2005 there are allegations that Shi’a organizations such as the Al Dawa Party and the Supreme Council of the Islamic Revolution in Iraq create arrest lists (with no charges listed) that have 97% of the names listed being Sunni. These lists are handed over the Sh’ia led military and police commandos who detain individuals without any due process. Human rights groups have alleged that many Sunni’s who have been found murdered execution style are individuals who are victims of this process. Back in the days of Saddam, there were periodic shortages of fuel, which resulted in a rationing system of only driving your car on alternate days depending on the last digit of your license plate. It was not unusual for a home to be without electricity for four to six hours a day. Back to the future of Iraq in Sept. 2005 driving on alternate days has returned to a country with 23% of the world’s know petroleum reserves. It is not unusual for a home to be without electricity for up to 12 or 14 hours every day. Back in the days of Saddam, there were a number of secret police organizations that operated without oversight from any government agency. They would detain, torture and sometimes kill Iraqis who were seen as posing a threat to the continued authority of Saddam and his cronies. Back to future of Iraq in Sept. 2005 the secret police organizations have returned. One such secret police organization is called the Wolf Brigade. In May of 2005 there was a car bombing at a bus station in Baghdad. The Wolf Brigade made a raid on a Palestinian complex the same night and arrested four Palestinian men. A neighbor said he overheard one of the brigade members say, “Is four Palestinians enough?” They were taken to a prison and tortured and then shown on television the next day, confessing to the car bombing. A lawyer hired by their families was able to visit them several weeks later (after paying a bribe to prison officials). He found them in the same clothing they had been arrested in, with burn and bruise marks over much of their bodies. Back in the days of Saddam there was such a multiplicity of ministries and bureaucracies that even Confucius would have been astounded. Back to the future of Iraq in Sept. 2005 the Christian Peacemaker Team must renew its official NGO status every three months. There is a new ministry, the Ministry of Civil Society (MoCS), which now handles NGO issues. The team went to the MoCS with its quarterly report but was told by the MoSC that foreign NGOs must now get a letter from the Ministry of Foreign Affairs (MoFA) that recognizes them as a legitimate foreign NGO. When the team went to the MoFA to get such a letter the team was told by officials at the MoFA that first they needed to get a letter from the MoCS authorizing the MoFA to write the letter requested by the MoCS. This was the quote today in my planner as I considered the tragedies both great and small, personal and global we are all dealing with. Within one week my Quaker meeting has lost two great souls. Both showed exceptional courage facing medical conditions that took their lives. One faced them all his life and the other faced them over a number of years. I don’t have a television but the images on the internet and newspapers of the devastation in the Gulf states are almost beyond comprehension. How what was a glorified thunderstorm off the coast of Africa several weeks ago could transform into itself into what we have called Hurricane Katrina is beyond me. I was planning on sending out the Christian Peacemaker Team in Iraq update from last week but it was simply too much bad news- a suicide bomber in our neighborhood; a friend of the team with typhoid from the drinking water in the city; the uncle of a colleague who died from the intense heat due to lack of electricity. It went on and on. And then today the incredible tragedy on the bridge leading into Kadamiah in Baghdad. A solemn religious processional turned into chaos and death. An event that would not have happened had not the events of the last two and one half years driven almost everybody in Iraq to the edge of the precipice of uncontrollable fear. Is there something in life that will fill this vacuum and prevent this sad wearing away of the heart? I have no idea but I do know that my heart feels differently when I consider the unknowable realms of disease and natural disaster compared to the man-made disasters that bring about death and destruction. I say “man-made” intentionally. We have seen again and again in the last one hundred years the evolution of warfare to the point now when the first two parts of war that have been in play for centuries, that of middle-age men sending out young men to fight and die to keep the middle-age men in power, has added a third component. Still the young fight and die to retain the power of the middle-age men but now most of those who lose their lives in the conflict are women and children. Four months ago the UN commissioned a study to look at Iraqi casualties since the beginning of the U.S. led invasion. The organization that undertook the study was a Swiss group that studies what they consider to be the true weapons of mass destruction- rifles and automatic weapons. Weapons using bullets have killed the vast majority of human beings in Iraq and everywhere else wars are being waged. The study stated that 40,000 Iraqis have probably died from violence since March of 2003. That includes death from U.S., Iraqi and insurgent violence. And 70% of those casualties were innocent non-combatants, mainly women and children. The only “something in my life” I can hold onto is to do what little I can to bring about the creation of the Peaceable Realm of God. It is my sense that such a realm will always have natural disasters. It is the “man-made” disasters that we are called upon to bring to and end. This is the end of my first week of living in Frederick County, Virginia, which is situated in the northern part of the Shenandoah Valley. While I’ve spent time there before working at Opequon Quaker Camp, it’s the first time I’ve really had a chance to interact with local citizens and get a sense of the community. I would have to say my first impression is that folks here operate under two main themes: Love of Country and Love of God. I’ve lived in the Washington, DC area for over thirty years, known is a bastion of patriotism, but even then I was not prepared for the plethora of red, white and blue that is part of the landscape here. Bumper stickers, flags on lawns, billboards; the colors of America are in evidence everywhere. As for love of God this week marks the first time in my life (I think) that I’ve been approached three different times with folks giving me bookmarks and other materials concerning salvation, Jesus and God. As I was unpacking I came across a pamphlet I forgot I had. It is entitled, “The Practice of the Love of God”. It is actually a transcript of a lecture that the Quaker economist and peace activist, Kenneth Boulding, gave right before the outbreak of World War II. He directed most of the talk to concerns he had regarding the conduct of the German people during the 1930’s. I’m hoping I’m way off base on this but as I took a break from moving and sat down to read it again I had a strong sense that much of what he had to say was applicable to my county, the United States, in 2005. I think it would be fair to say that a survey of opinion taken from news sources in various parts of the world would find people using the words “fear and hatred” much more often than they would use the words “respect and love” when it comes to describing the United States. Not only in the Middle East but in Europe and in much of Asia and other areas as well. We are seen more as an empire rather than a beacon of hope to the oppressed and downtrodden. We are seen more as a militaristic superpower, bent on imposing our will on others, rather than the keeper of the flame of the hope and promise of democracy.